The panic has prompted investors to dump eurozone bank shares, with BBVA, UniCredit, and BNP, which have significant operations in Turkey, the worst effected. Shares in Spain’s BBVA were down 5.7 percent late on Friday, Italy’s UniCredit off 6.4 percent, and France’s BNP Paribas dropping 4.4 percent, all exceeding a 4.3 percent drop in the euro zone bank index, according to Reuters. The ECB is concerned that the contagion will result in Turkish borrowers defaulting on foreign currency loans, which make up about 40 percent of the Turkish banking sector’s assets, according to the Financial Times. The currency has already fallen 36 percent in 2018 and has slid against the dollar on Friday. 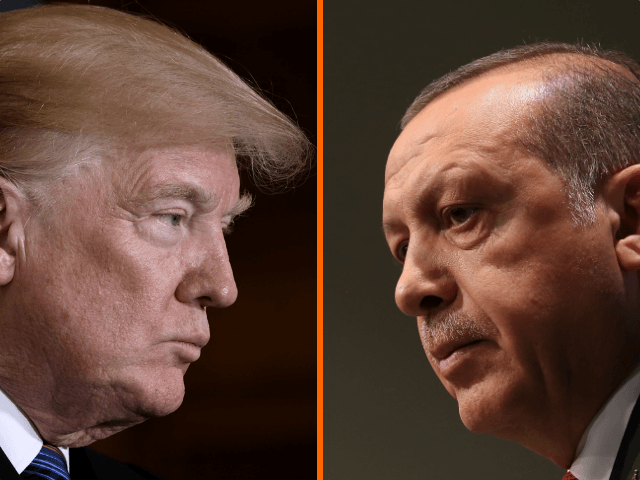 Also on Friday, relations between the United States and Turkey have worsened over the fundamentalist Muslim-majority country’s detention of American pastor Andrew Brunson, who was arrested by authorities during a post-military coup attempt in 2016. “Aluminum will now be 20% and Steel 50%,” President Trump wrote. Erdoğan attempted to downplay economic concerns by telling Turks “not to worry”, telling supporters they were in an “economic war” and to convert their dollars and “gold under the pillow” into lira. His tone echoed that of a speech given on Thursday when he told supporters that “if they have dollars, we have our people, our righteousness, and our God”. The contagion of instability from Turkey into Europe may extend beyond the financial, should the country decide to or find itself no longer able to keep up with its end of the EU-Turkey agreement to stop the flow of Middle Eastern migrants across the Mediterranean into Greece, resulting in a second migrant crisis. Gerald Tatzgern, of Austria’s Federal Criminal Police Office (BKA), suggested last month that the deal could only be maintained depending on the stability of Turkey — which could be unravelled if the economy crashes.